Against this backdrop, Braga argues that a firm focused solely on systematic fund management has “advantages of scale, and can design products in a more granular and specific way, so now is a good time to monetise those advantages.” Braga thinks that discretionary and systematic asset management are culturally different, in that “team work is essential on the systematic side, whereas the discretionary side is a collection of people doing different things.” Chief investment officer, David Kitson agrees that “the priorities of a discretionary group are quite different,” and reckons that a purely systematic business is well positioned to meet the demands of increasingly sophisticated and institutionalised hedge fund investors, such as pension funds. Head of trading and counterparty management, Bertil Meijer, opines that branding as a focused systematic shop is valuable, and finds that a specialised environment allows him to hone and refine multiple facets of the trade execution process that bring benefits including lower trading costs. Chief operating officer, Matt Kilsby, also relishes the freedom he has to fine-tune the third and future generations of the trading platform, and other technological infrastructure, to highly specific requirements of systematic trading, without worrying about the bespoke quirks of discretionary traders. THFJ met these four partners of Systematica at their Geneva offices. Braga pithily summarises her approach to team building by saying, “We let smart people understand where we are going and then let them get on with it.” Drawing parallels with dance, she says, “we incorporate each person’s expertise into the choreography.” In broad terms there are three functional divisions: research, trading and technology. Braga and former J.P. Morgan proprietary trader Kitson have oversight of the whole product including research, investment decisions and portfolio construction; trading platformsexpert Meijer executes macro and single equities, while technology expert Kilsby is constantly improving technology across all of the funds. An example of how the team works shows how it is far more collegiate than siloed, illustrating how Kitson finds systematic fund management to be far more collaborative than it is discretionary. Meijer might flag up that a particular asset or sector is becoming more expensive to execute. Kitson could then ask researchers if that market could be traded on slower timeframes. The baton is then handed onto Kilsby, who makes sure the technology systems can accommodate the roll-out of the slower models. This dialogue is not restricted to the four partners – Braga makes efforts to ensure connectivity throughout Systematica’s global offices (Geneva, London, Jersey, Singapore and New York). “We have to ensure information flow amongst the offices, otherwise people are remote and unplugged,” she stresses. So there are weekly calls with overseas offices, and offsite weekends for everyone to discuss everything in close proximity. Yet some activities need to stay in one office. All trading in European and US markets is still done from the Geneva office between 8am and 10pm on shifts. Meijer insists that “there would be no benefit in transporting a team to New York City, as we would lose efficiency and communication, and news would not make it back to David and Matt.” Braga admits that “it is a balancing act to have a few bases and tap into the talent,” and is confident that Systematica is striking the right balance. Systematica’s global office network is partly a consequence of BlueCrest’s decision to diversify its own office locations after a discussion process. “BlueCrest has a very global investor base, but was super London-centric,” recalls Braga. Each of Systematica’s locations provides advantages. 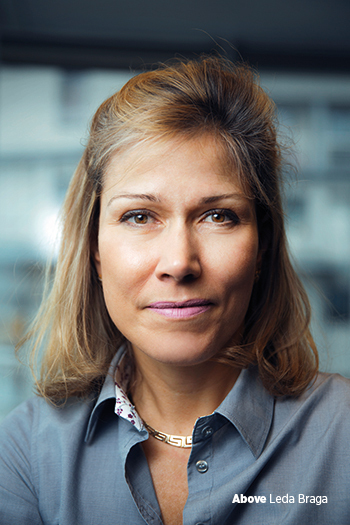 “The parent company and head office is now Jersey-based; the UK is a great place to base a business; Geneva has lots of private wealth clients and we have hired some people from CERN laboratory, especially on the technology side; and Singapore is useful for 24-hour trading, as we do not want to work staff round the clock.” But Systematica has not inherited all of BlueCrest’s offices. A Sao Paolo office was set up to trade Brazilian interest rate products, but although Braga was born in Brazil there is no business rationale for Systematica to open an office there when it trades only two products in the region. Systematica accepts the industry-standard explanations for why CTAs had a stellar 2008 (when the BlueTrend programme made over 40%) and then generally struggled between 2009 and 2013, before strongly recovering in 2014. Says Kitson, “post-2008 central bank intervention was stabilising assets, but since 2014 we see the release of some pent-up pressure as the US government eases off intervention.” He adds that volatility has started to move up from the depressed levels seen three or four years ago, and interestingly this year increased volatility has gone hand in hand with new highs for the equity markets, contrary to the usual inverse link. Kitson surmises that more volatility is creating better trends. Braga enjoyed studying engineering to PhD level, at Imperial College London, and lecturing there, because “I like to solve problems and mathematics is a fantastic language to express thoughts in.” She has no idea why women are less likely to pursue science at postgraduate level. While Systematica does have some bias towards hiring PhDs from maths, physics and engineering, the firm has a wider mix of disciplines, hiring from economics, finance, computer science and signal processing as well. The team reads huge amounts of academic research, but Kitson stresses that “we do not take canned research, but can get the initial inspiration from academic journals.” The way in which Systematica applies the raw research ideas differentiates it from other quant shops. Whether the rebalancing of alphas has done better than a fixed mix is hard to judge, as each of the models is continually varying. But when Systematica back-tested today’s suite of models against those prevailing historically, they estimated returns would have been as good or slightly better in all years and worse in none – which reassures Kitson that “the research process is working,” and suggests that improving the models matters more than timing them. Systematica reviews the universe of instruments traded each quarter, and can exercise discretion to add new markets or remove them, albeit based mainly on quantitative criteria such as open interest, daily liquidity, volatility and how well markets trend. For instance, gold, oil and kerosene on the Tokyo Commodities exchange were removed after their liquidity declined. As well, Meijer has noticed liquidity on the London Metal Exchange decreasing, due, he thinks, to a number of banks withdrawing from LME market making. So is liquidity in general dropping as regulations force banks to retreat from market making? Meijer sees a mixed picture, and points out that it partly depends on which measure is used. Granted, volumes in the German bund future were down to 750,000 per day in January 2015, from one million back in 2011. But Meijer points out that the notional exposure remains similar – as the contract price has increased to 160 from 125. And some markets are seeing noticeable increases in trading volumes – liquidity in the VIX future keeps on increasing, for instance. As CTAs are essentially long of volatility and are not selling it, they need price movement to make money, so markets that are too quiet can be removed. Back in 2003 the BlueTrend programme removed short-term Japanese interest rates from the strategy, as their price was too stable to be of interest. The BlueTrend programme also ceased trading the short end of the US interest rate curve after the zero interest rate policy was introduced. Right now it also sounds as if short-dated government bonds with negative yields could be strong candidates for removal. The ultimate case of a non-volatile market is, of course, a pegged currency, and Systematica avoids trading these markets. Hence when the Swiss franc was pegged to the euro in September 2011, the team intervened to almost entirely remove the currency from their models. The rationale was simply that “the models would have no conception of how history would predict the future,” recalls Kitson. Systematica had not reintroduced the Swiss franc when we met, as they did not think it had sufficient recent history as a freely floating currency. The partners at Systematica agree that trend following continued to work well post-crisis in over the counter (OTC) non-futures markets, but Kitson is “not sure what mechanism was at work or why the OTC markets did better.” Nevertheless, he says, “You cannot argue with the returns,” so Systematica is increasing its suite of OTC markets. The BlueTrend programme has always traded interest rate swaps and currency forwards, and coming from an investment banking background, the team is comfortable with OTC trading. Braga points out that the barriers to entry are higher for OTC trading, as you need a range of ISDAs and execution capabilities, and more importantly, “You need to be big enough for banks to find you a worthwhile counterparty to trade with.” Options, however, are not on the menu for now. 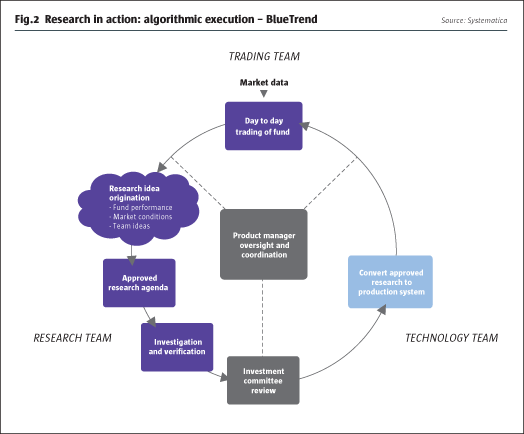 Athough Kitson has traded options at J.P. Morgan, and Braga has modelled and valued them, at Cygnifi, for now the BlueTrend and BlueMatrix programmes will trade linear, delta one instruments. Despite these various differentiators, Systematica expect their returns to continue showing some correlation with those of other trend followers, but Braga points out that “small changes in setting and speed can impact the profile by a lot” and may explain some periods of decoupling between the BlueTrend programme and other CTAs. She observes that some CTAs are de-correlating because “they mix single stocks with futures and we think that’s very bold”. Systematica prefers to trade single stocks in a separate programme – BlueMatrix, which we touch on later. Some CTAs have also diverged from their peers by de-emphasising momentum models but BlueTrend will stay true to its name with a substantial trend component. Trend followers are agnostic on market direction and Braga thinks the ability to go short is particularly useful as a diversifier for institutional investors that have large long weightings in equities. Scope to short is useful as “it is not human nature to bet against things, it is human nature to buy things that you like”. BlueTrend already has a London Stock Exchange-listed closed-end fund, with ticker BBTS, that can be owned by anyone with a brokerage account, and Systematica continues to receive sub-allocations from BlueCrest’s LSE-listed AllBlue, which has tickers BABS, BABE, and BABU for its sterling, euro and US dollar share classes. Systematica already has a ‘40 Act product via the Equinox platform for the US market. Unlike the old UCITS, this fund is not intended to be a replica of the main BlueTrend programme, as the strategy includes elements of systematic macro. The first UCITS launch from Systematica is set to be a wrapper for their BlueMatrix fund. This will be an independently run, Irish-domiciled UCITS rather than on any platform. Kitson estimates capacity for the BlueMatrix strategy, which currently runs $600 million, could be as high as $2 billion, but acknowledges that this will only be discovered through experience. 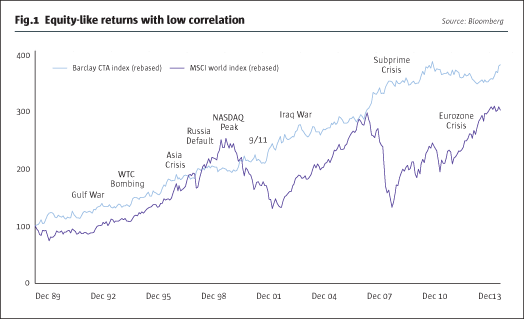 In 2007 the BlueMatrix programme started out doing what is often termed “statistical arbitrage”, entailing shorter-term price mean reversion, but quickly found this was a capacity-constrained strategy that was also challenged by the risk on/risk off world increasing correlations between securities through time, and reducing cross-sectional correlations through space. Braga’s response was that “we upgraded the fund with multiple alpha sources, of which mean reversion was only one, so the BlueMatrix programme should now be seen as a more diversified quantitative equity programme.” A variety of technical and fundamental signals are used, including some innovative ones, across global developed and emerging equity markets. Fundamental data, including corporate accounting data, is one input, with analyst earnings revisions making up perhaps 20% or 30% of inputs. Of course, “cleaning the data is super-important,” stresses Braga. The BlueMatrix programme is also thinking laterally, throughout the supply chain, and using data from suppliers or customers to draw inferences about probable implications for other companies along the chain. Furthermore, the BlueMatrix programme is moving into the new frontiers of researching news, events and sentiment. Each of these inputs is complementary and, drawing analogies with classical antiquity this time, Braga says, “If you have oracles you must let them talk to each other.” Beta is near zero at the market and regional level, and is pretty low at the sector level. While BlueMatrix pays some homage to trend following via the momentum signals, trend will never become a large part of the strategy. Liquid alternatives is one of many directions in which Systematica is developing, but high-frequency trading is not one of them. As aforementioned, adding more over the counter markets to the investment universe is an ongoing project, and Systematica feels confident about obtaining access to these markets. More radically, Braga says the firm is looking into products that might be viable to run without any performance fee. And a long-only offering could be considered for the pension fund market. Systematic and Braga may be, justifiably, most renowned for the BlueTrend programme, but their research, trading and technology resources are making strides into “quantamental” or quant fundamental strategies, including systematic macro and single equities, as well as more traditional asset management. Systematica aspires to build a powerhouse straddling long-only and absolute return as well as hedge funds – and catering for a continuum of clients from the smallest retail investor to the largest institution. Running a trading desk has manifold angles: pre-trade analysis, routing via multiple trading channels, automation, and using algorithms built by the in-house team, but the process does not stop after trade confirms are received. Meijer needs to be constantly alert to when and where his execution is outperforming or underperforming its benchmarks, as these conclusions then feed back into the start of the process – and might lead to changes. “We might need to adjust timing, aggressiveness, or passiveness – it’s a very data-driven process,” explains Meijer. At the same time, he is not micro-managing it to the point of being a perfectionist with each individual trade – rather he looks at it from 40,000 feet. Meijer views the new generation of data-driven traders as being a far cry from the noisy floor traders of yesteryear. In fact, Meijer finds that these days as little as 8% of daily volumes can have an adverse ripple effect, so his systems are designed to adapt more swiftly. Meijer reiterates the team mantra “that trading and execution is not just about reducing costs” – it is also a holistic part of adding value to the portfolio construction process, helping to determine which markets are cheaper or more expensive to trade in order to reach the optimal portfolio solution. But netting, or internalising order flow, is one way in which Systematica can potentially reduce costs across all markets. Systematica is trading more than 200 assets and over 4,000 single-name equities, adding up to a notional volume of $5 billion a day. In this environment, Braga says, “netting trades where permitted is hugely beneficial in reducing costs,” and Systematica is now netting between 15% and 20% of its own flow. Yet netting in such a complex environment constitutes a multi-dimensional optimisation problem. When models are trading the same market at different speeds, one model that is long can be partially offset against another that is short. But it gets much more complicated than this, because the same strategy can be run across multiple legal entities, including funds and managed accounts, and netting can then run into obstacles around legal, regulatory or exchange rules. The number of dimensions and parameters entailed is difficult for a human mathematician to keep track of, so Systematica has devised algorithms that allow for the constraints and allocate accordingly – netting wherever possible. Systematica is onto the third generation of its proprietary trading platform, but Kilsby is looking ahead to the fourth and fifth generations, including now looking at the front-back holistic view for the whole firm and the operational functions. He will say that key characteristics are time to market within a robust infrastructure, and then Braga steps in to elaborate how the platform has changed beyond recognition since the first one. “Back in 2003 we had Excel spreadsheets, Bloomberg feeds and a C++ library, and this was just not robust,” she says. This seems to prompt techy Kilsby, who was head of European technology for Citadel, into spilling some key benefits: “high fault tolerance, the ability to start up engines in any location, and safety fuses across the platform that aim to protect us from past industry experiences, e.g., Knight Capital, minimising the chances of a technical mistake.” Despite all of this automation, an extra check and balance comes in the form of a team of human execution traders who still authorise each and every decision. The systems are ideally geared to cater for client demands of customisation that can entail specialist mandates and constraints, via dedicated managed accounts. Braga summarises the three key benefits of the tech platform as agility, flexibility and robustness.